The ambitious project increased the useable work space by 30% and number of employees by 50% through employing four new staff members. The Bridging the Gap grant largely funded the building development work that started in January 2015 by constructing new rooms and purchasing new equipment and tools. The staffing, induction and training phase occurred during the fourth quart of 2014 and was funded through retained profits set aside to match the Bridging the Gap grant. The whole project was completed by the end of March 2015.number of employees by 50% through employing four new staff members. The Bridging the Gap grant largely funded the building development work that started in January 2015 by constructing new rooms and purchasing new equipment and tools. The staffing, induction and training phase occurred during the fourth quart of 2014 and was funded through retained profits set aside to match the Bridging the Gap grant. The whole project was completed by the end of March 2015. Steve Braithwaite, Managing Director of ASH, said “we are delighted to have completed this significant step in enabling us to achieve our ambitious growth plans. It has been a tremendous few years of growth for the company having doubled our turnover for the last two years running and we are on track to the same this year. Making suitable space available within our existing premises and recruiting the right people to enable this growth has been critical. One of the key drivers for us has been fulfilling the increasing requests from clients for low volume, final assembly and test projects. In many of these cases the sub-assemblies are assembled by contract electronics manufacturers in the Solent region. Some examples of this are substation transformer temperature monitors to be used in Brighton or structural displacement monitors for use in homes and civil engineering projects such as Crossrail in London. ASH successfully passed the competitive phase of the funding application in the middle of 2014, started the project in the last quarter of 2014 and then completed the final stage by the end of March 2015. The Solent LEP, in partnership with Southampton City Council and The Daily Echo, launched Bridging the Gap as a competitive fund, overseen by an Investment Panel tasked with looking to identify those projects which can create or safeguard the most jobs and leverage the most private sector investment into SMEs. Phase 2 of the funding programme has been supporting new business start-ups and SMEs (Small and Medium Enterprises) in Southampton, the Isle of Wight and the waterside parishes of the New Forest. Individuals and businesses have been able to apply to the £1.85m fund for grants of between £5,000 and £50,000 to start up a new business, grow an existing business or safeguard jobs. The building developments provided a valuable new final assembly and test facilities for small production volumes. To do this we knocked through and converted three unused storage rooms and part of the existing kitchen before then fitted out the new laboratory. The images below give a flavour of some of the stages involved and let us show off our new workspace! Part of the kitchen, two cupboards and a work room were knocked through to make a viable space. The redundant doors were then bricked up. The new lab had a window built into it to give ventilation and extra light. The increased work space allows increased production capability. 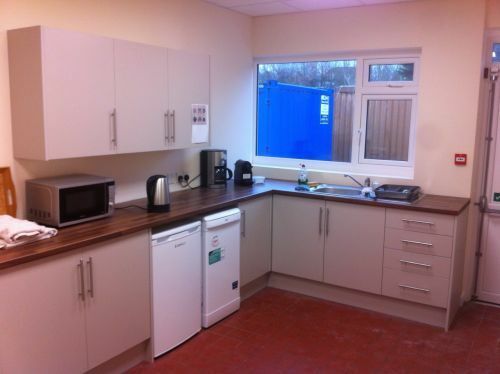 The new kitchen provides greater flexibility as we gain more staff. Part of the Bridging the Gap grant was also used to purchase equipment that will increase our production testing capability and continue with design and development activities more efficiently. This included shiny equipment including a new Spectrum Analyser, a Source Measurement Unit and five new Oscilloscopes. Creating new jobs is core to our ambitious growth plans along with our desire to become a significant employer of electronic engineers in the area. As part of the project we employed the four new members of staff to fit our current needs, expanding our capacity and skills we offer to clients, whilst also paying attention to the business process development required as the company grows. 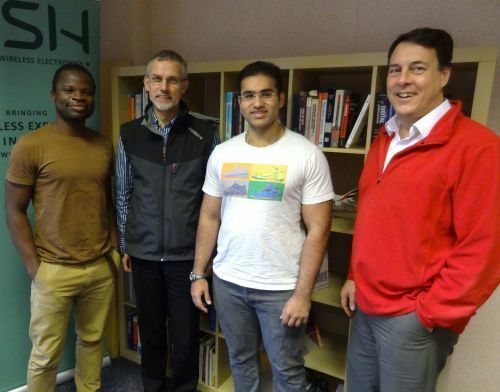 From left to right: Arinze Ekwosimba (Junior Engineer), Tony Morgan-Jones (Administrator), Laique Gadhwala (Junior Engineer), and Richard Lucas (Business Engineering Manager). One of the 46 Directional Earth Fault Passage Indication (DEFPI) units for use in electricity substation transformers. These are a good example of low volume, high value production. 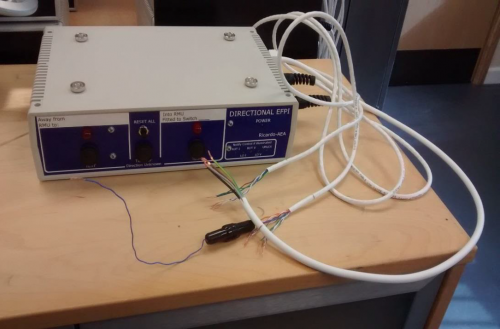 Each unit involved the integration of three PCB s and their associated interface wiring, along with case construction, front panel drilling, verification and final testing. The OWLS (Overhead Wireless Lookout System) units follow a similar pattern of production: small scale assembly. The completion of the new laboratory enabled us to complete some additional expansion and double our office space, funded independently of the Bridging the Gap scheme. Providing an environment in which all members of staff can now work together greatly enhances team communication and makes the working environment much more efficient. 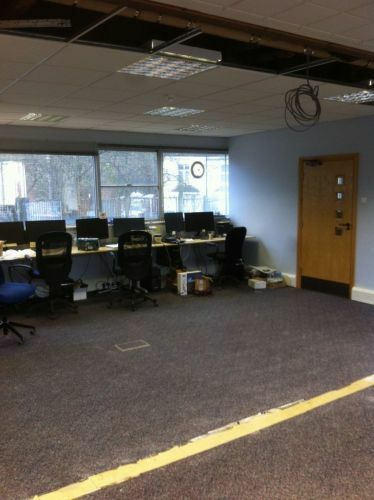 The two main rooms that comprised our original office and lab space were knocked through to make one large open plan area. Expanded individual work stations gave each team member far more room to work as well as space for more new staff members, as and when they are recruited. The individual table space per engineer is dramatically increased providing better working conditions and enabling greater efficiency and productivity. The increased desk space allows for far greater flexibility and room for the new members of staff that we expect to employ later this year. The new facilities have already proved their worth in the few short months since completion as we have processed a number of large scale orders that would have been extremely difficult previously. Additionally, these orders would not have been possible without the new team members who have made a huge difference to the company. Their additional skills in sales, organisation and management along with their technical competence in the laboratory have combined to make us a very effective team. This puts us in a very strong position to move forward and we are now well into the process of recruiting more staff and continuing our ambitious expansion of the business. Further photos of the building work can be found in our Facebook gallery.